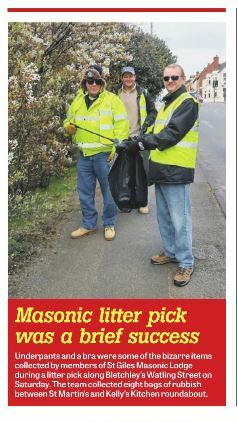 ​Members of St Giles Lodge based in Bletchley spend a Saturday morning picking up litter along Watling Street (From St Martins Church to the Kelly’s Kitchen Roundabout). They collected 8 bags of rubbish which included a cup from a bra, Baby’s dummy and a pair of underpants! Michael Perkins who is the Master of the Lodge said “we enjoyed each other’s company whilst doing something for the community, I would like to thank the members of St Giles that gave up their Saturday morning to support me”.